We had spent a couple of days hiking, relaxing and me flyfishing in this beautiful place. I was busy grilling up the burgers that evening. Mrs T was reading comfortably in the camp chair some distance away. 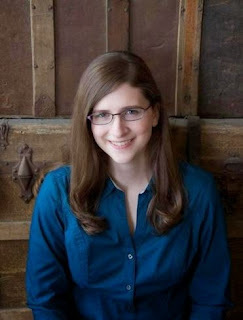 She was wearing a white blouse with colorful flower prints. That's important! Suddenly, agitated, her arms were swinging wildly. Thinking, perhaps, a few marauding mosquitoes, I hollered "what's the matter." "He's attacking me," was the reply. Rushing over, I found a nearsighted hummingbird going for the gold. 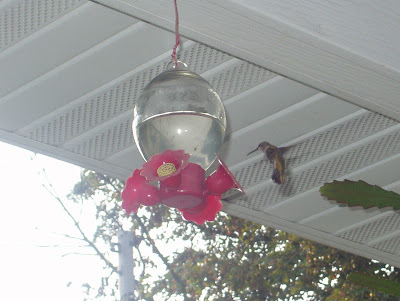 "It's a hummingbird who thinks your a petunia," I counseled sympathetically. Finally, the misguided bird buzzed off and peace returned to the Valley. 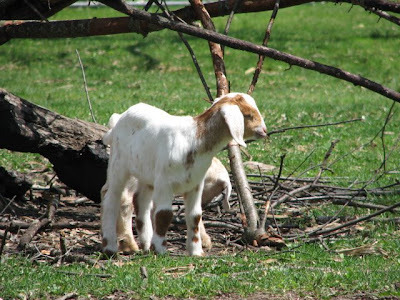 More recently we were sitting on the front porch reading the paper and watching our neighbors across the road - the goats. 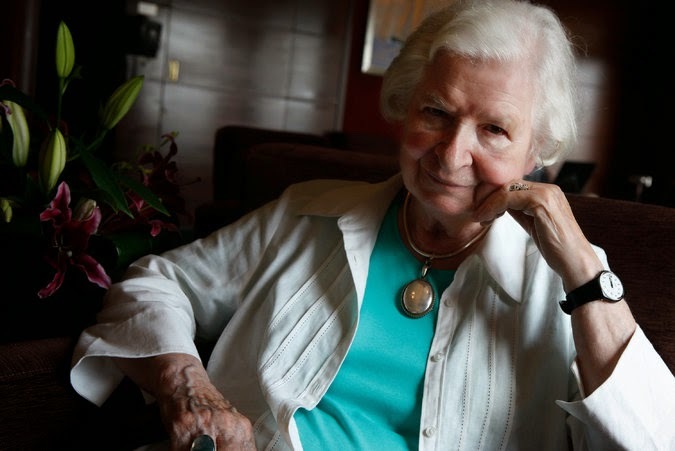 Mrs T began showing that agitated look. Another visitor had appeared above us. At 1/8 ounce he still appeared aggressive. I gave him a no nonsense warning. He backed off. "Don't worry dear I'm here to protect you," I volunteered. That's right. I da man. 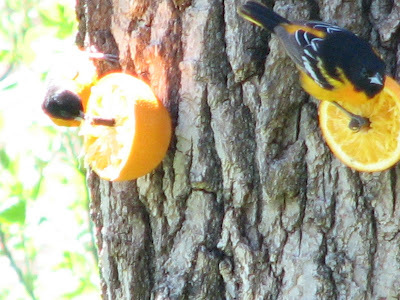 I was a rookie birder, a few springs ago, pretty raw actually. Didn't really know which way to go. The idea was to eyeball some of the Baltimore gang in my backyard. You know. The kind that fly. I wanted to keep tabs on them. That's my job see. Then I caught a lucky break. Some guy told me they were attracted to orange slices and grape jelly. Go figure. I tried it. The oranges that is. Would you believe it , no sooner than I went into the house for my morning joe, and came back out on the deck, there they were. Ten minutes flat. Over the next few days several more of the gang showed up. I thought I had them cold. Wrong! Just like that they all went on the lam. Maybe north of the border? Well, the next spring I was determined to try again. Maybe add some grape jelly. I thought at first they had sent a scout ahead. One of the gang showed up in the middle of a spring snowstorm right outside my window . And again disappeared. 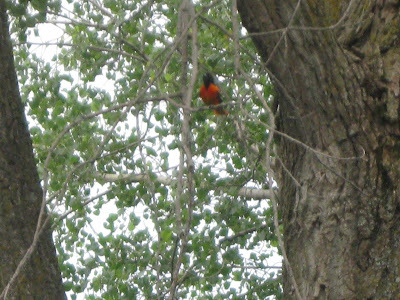 A week latter another colorful visitor showed up. No luck there either. 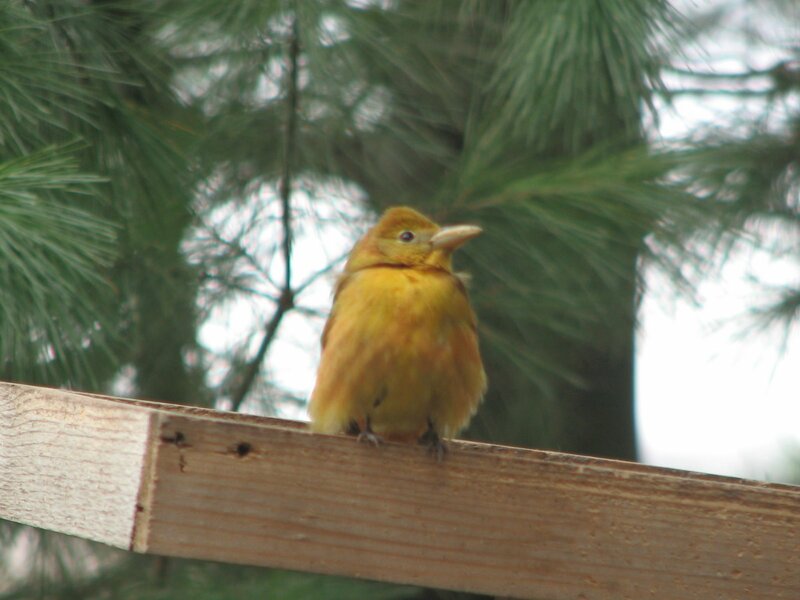 It turned out to be a member of the summer tanager gang. They come from down south someplace. They were clean. I waited and waited. Nothing. Funny thing though. The oranges kept disappearing. And the Baltimores were nowhere to be seen. I finally set up an early morning surveillance. Turned out to be squirrels. No respect for law and order, I guess. From the pond we headed up a trail into the woods. Soon the path was lined by some huge cottonwoods. When I looked up to see how tall they were... that's when I noticed them. The Baltimore gangs hideout. I counted at least ten scattering in all directions. I thought I heard one squeek "we're busted." Well that's the story folks. 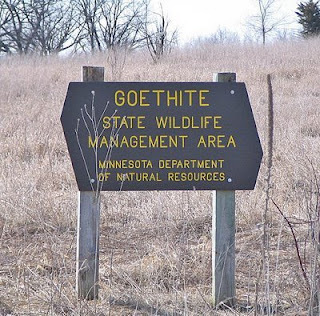 They call it the Goethite Wildlife Management Area. Coulda fooled me. 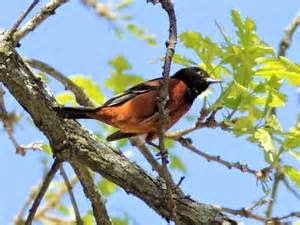 I can see these Baltimores, being from a big city, as being used to wildlife. But being managed? Not a chance. I know I couldn't control them. 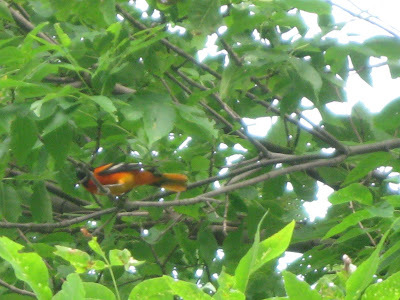 btw - On the way back to the big city I caught sight of a related gang member - an Orchard Oriole. But that's another story. He wasn't quite a year old that spring. 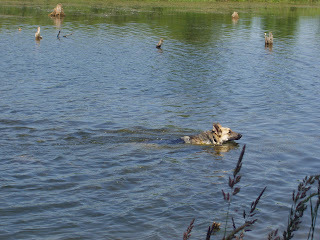 My first ever GSD Baron would have nothing to do with the water. This came as something of a shock to me as my previous three dogs, a Golden-Lab mix and two Chesapeakes, could hardly be kept out of it. At a local trout stream the water was apparently too cold and fast moving for Baron. A local pond had high banks and a muddy bottom. He didn't even go near it. Then finally, we went on a hike at a nearby state park. The park seemed abandoned in the spring with nary a person in sight. On the well groomed and sandy "no dogs allowed" beach Baron discovered a stick. 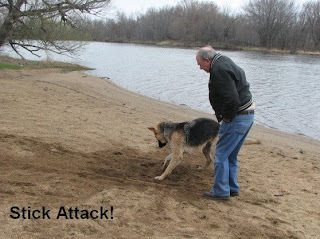 He decided to attack it! 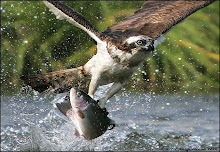 Then I threw it in the water and he chased after it. Voila! He was swimming. Queen B looked astonished and then worried . I reassured her by mentioning that he was born knowing a basic swimming stroke. The "dog paddle." "You think Michael Phelps is good? Well look at me," says Baron. Me and Miss Lily last winter in Florida. She wanted no part of it. In any case, Mrs. T was worried about lurking alligators. So there we were taking an April woodsy walk thru gorgeous Forestville State Park. 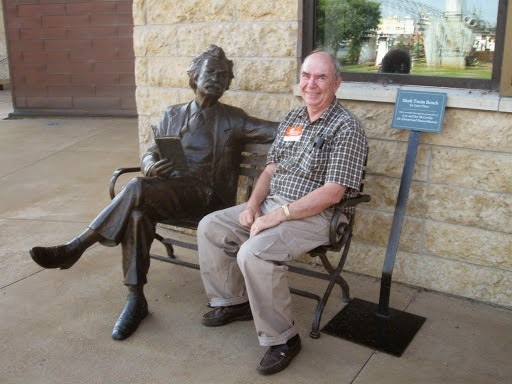 I had my two girls with me, Mrs. T. and Miss Lily. 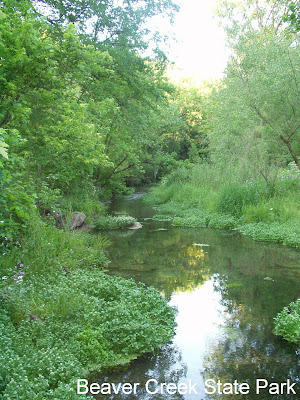 We were checking out woodland wildflowers along some cliffs and a trout stream in southeastern Minnesota. Sometimes change can be upsetting. Then again it can bring great rewards. Old friends disappear from our lives. New ones appears out of the blue. Twelve years ago, we built a new house some 200 yards to the north, in our woods. I put up several platform and hanging feeders in the backyard. 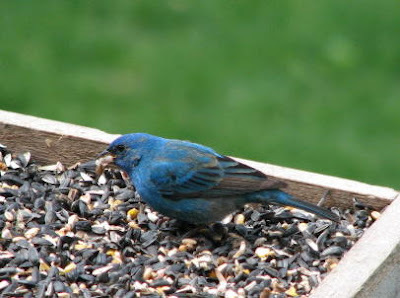 New friends the Indigo Buntings now stop by. An eastern screech owl took up residence in an old wood duck house. For the first time, a bluebird pair nested along the cornfield. 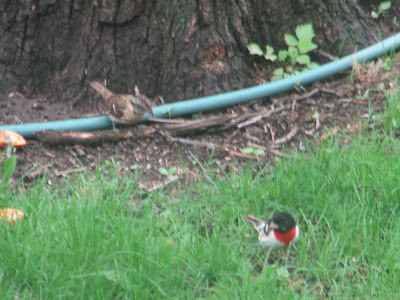 And first ever tufted titmice showed up regularly while a summer tanager made an unprecedented visit this spring. 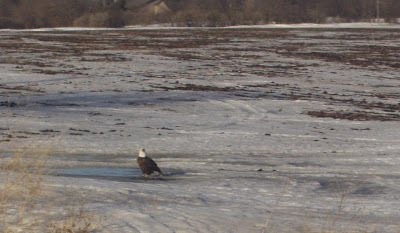 Even a bald eagle landed near our property line in March to look over my backyard. On the other hand some old friends were definitely missing. No longer would I see the red headed woodpeckers chase the squirrels away from the feeder. Its been years since I have heard the song of the eastern meadowlark. Purple martins are not to be seen circling above the yard in the spring. 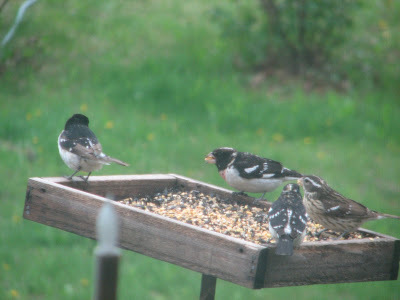 Worst of all, there were no rose breasted grosbeaks downing their daily ration of sunflowers seeds. Till this week. Looking up from the book I was reading in my easy chair, I noticed movement in the backyard. 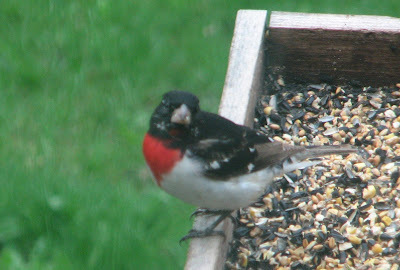 To my utter surprise, the platform feeder had four rose breasted grosbeaks aboard. In addition, their were several clinging to the hanging feeders as well as on the ground. It was a RBG bonanza! Her name is S.M. 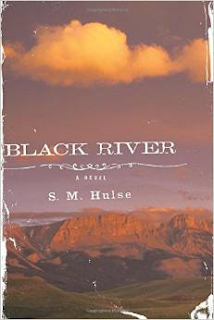 Hulse and she wrote the best debut novel I've read in a long time. Back in the day when I was a child (actually the forties) our extended family saved things. Things like grease for making soap, clothing for quilts, and animal parts for God knows what, with names like "blood sausage & head cheese." Then there was the "rag bag" for taking rags to my Dad's Aunt Martha in Green Isle, Minnesota. She had a large loom with pedals and bobbins. For making "rag rugs." Here is mine. Well used you might say. And it was as the name tags on the end that tell the story. All day every day kindergarten required nap time on the floor of the classroom in those days, so a rug was naturally needed. Thus mine was used and passed on to my siblings and later a son. Tony our youngest didn't require the services of the "rag rug" because our local school district switched to half day kindergarten. Nope this relic won't be going to the Goodwill any time soon!! !